I'm so sorry you had to go through all that, but I'm thankful it turned out as well as it did! As for the tugging, a couple different trainers suggested that to help keep Cooper focused and redirected when he got super excited out and about. Unfortunately, he has zero interest in tugging. If he can't shred a toy to pieces, he has no interest in it. Did you have to teach Ruby to tug or was it natural? Tugging is Ruby's absolute favorite activity - she's a natural! She takes toys to other dogs as well to initiate a game. Lara, another great post :) It caught my attention because tugging is a big part of training with Stella. Its great. The best tug that I have found is the Kong Wubba. This has really helped me teach Stella how to fetch. I throw one, she brings it back and drops it at my feet, then I throw the other. when she starts to lose attention we play tug, which gets her excited again. She is great at "drop it". This has helped teach her to fetch, we are transitioning into balls. But its neat to see her "get it". If I actually leave the Wubba with Stella she will destroy it. I tested it once, and it took her about 2 days. still strong, but not stront enough. I agree with you about the toys. Its very frustrating to test them out to see which is indestructible. Ive been sticking with the Kong brand. Check out the Kong bouncer. Its a lot of fun and its squishy! also the Kong Wobble treat dispenser. 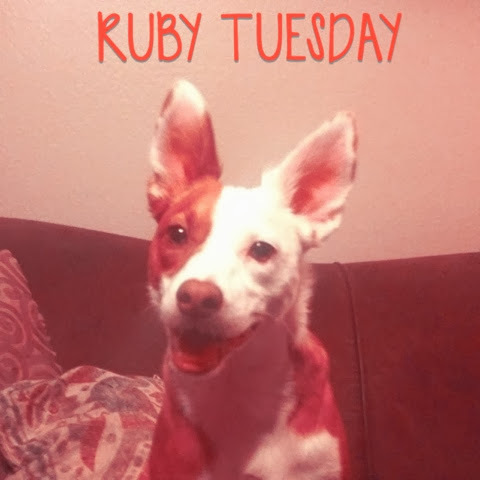 Glad to hear little miss Ruby is okay!! we too had a trip to the vet on Saturday. Stellas face blew up, and she had bumps all over her body. some sort of allergic reaction. ?? Thanks so much for your comment, Lori. I have looked at the Kong Wubba before and I do like Kong products. We have the classic Kong, a SafeStix and a squeaky ball. I think the Walk-e-Woo is going to last us a long time if I keep it put away, and I already want one in another color (I am such a dog product nut!). My Chow/GSD mix had a similar reaction - her muzzle looked like a Sharpei - after a trip to the barn, the vet suspected a spider bite. I'm happy to hear about your little victory on your walk last night! Thanks! Its been tough. we are having guests this weekend and my anxiety is HIGH. But all we can do is work through it. Ill have to look into the SafeStix and Walk-e-Woo. I too have an addiction to dog products! Don't get the SafeStix in pink, that's all I'm saying. I didn't have a choice and I'm a bit embarrassed to have it lying around. There are some amusing reviews on Amazon. LAUGHING!!!!!!! That was my first thought when I saw it in the pet store.... why must they look like this......... haha Lara! Rodrigo can't be trusted with toys with squeakers, because he swallows the squeakers. I still allow him to play with the toys from time to time, but always under supervision. I've learned that "supervision" doesn't mean while I'm blogging. "I've learned that "supervision" doesn't mean while I'm blogging." Exactly! I was within a few feet of her when she swallowed the piece, but she gulps it down even faster when she knows I don't want her to have it - naughty terrier streak! All the more reason we are working on "drop it." She tends to spit out pieces of plastic/rubber toys, but she thought plush fur was yummy for whatever reason. She recovered very quickly and was not impressed with her 72 hour limited diet (she liked the chicken and rice but the quantities were not to her standards) - I can't be certain what it was that made her sick, but the toy piece was the most likely culprit. These tug games, they sound so familiar! We, too, spend a lot of time with tug and use it to teach a lot of things. I taught heeling almost entirely with tug, first holding the toy so that Silas would walk with me, and then putting the toy nearby while we walked around. Now I can put the toy on the ground and reward Silas by releasing him to go get the toy. Our best tuggies, in no particular order: West Paw designs rubber toys. They don't look like much (Silas's favorite is just a rubber stick thing, second best looks like a Z), but they last and Silas loves them. Bionic Toss--n-tug Frisbee (the other Bionic toys are not flexible enough to tug). JW Pets Holee Roller ball. Kong Wubba--it's fabric-covered, but ours has held up to a *lot* of play. A homemade braided fleece tug, which is great because it's long enough to put around my neck while we work. An Udder Tug (helpingudders.com), but it REEKS of barn. Most of these are tough enough to leave out, but the fleece rope and the Udder Tug get put away. For balls, our best ones are from Planet Dog. I like their recycled ones, not so much because they're recycled as because they're softer and less likely to damage the walls when we play indoors.